The Metrics Sheet is a fast and free document that helps you on your journey to create the perfect social media marketing plan. The Metrics Sheet provides you with a way to properly assess your posts compared with your subscribers and activity so you can adjust your strategy for a way to continually grow your following. With a convenient tab for you to enter all your published items you can easily transition from posting your material to analyzing the data! Master your marketing strategy by using this template! 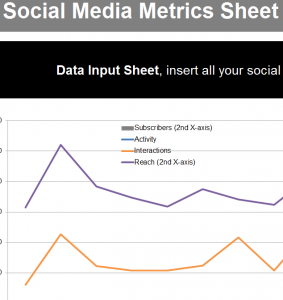 Start in the “Insert Data Here “tab to enter your social media metrics information. Below the graph there is a set of tables with a list of each day you want to make a post in the form of a convenient calendar! The sections are separated by color-coordinated rows that tell you what’s included for each table. The blue section lists your posts and the orange section lists your follower’s posts. Next, the purple section is a calculated table that lists the traffic that your post might have seen, and the final gray section is where the template informs you about the size of your network from unique individuals. The tables will calculate all your entered numbers and display the totals in the green rows at the bottom. This will help you analyze your current attempts at better marketing strategies and adjust to fit your needs. The “Heartbeat” tab is where you can view your information in one clear overview. The graph at the top of this page compares your conversation relevance to your activity from month to month. Everything you need to organize and analyze your posts to better understand the trends that make up your target audience.